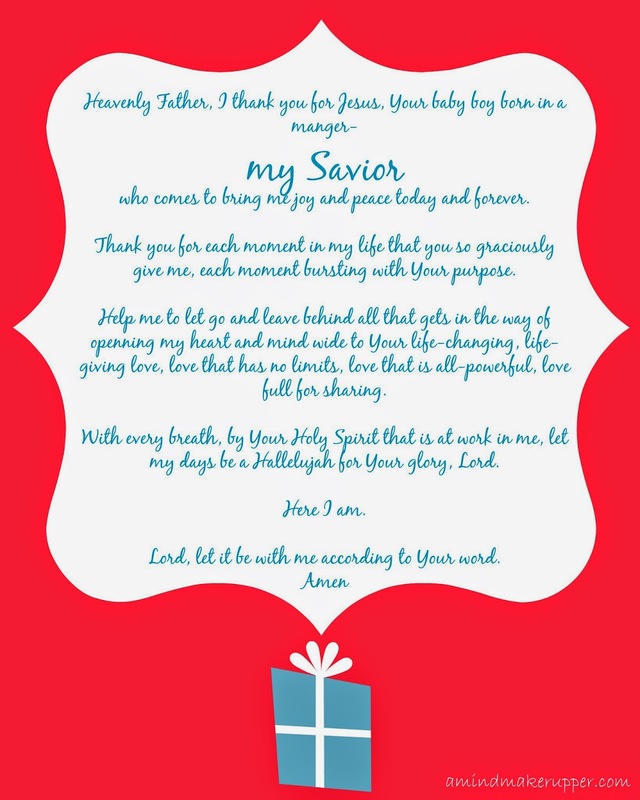 One of the inspirations for this prayer was a song called "Hallelujah Christmas" by Cloverton. I heard it first on Facebook...It's hands down one of the most moving Christmas songs I've ever heard. Enjoy! Jesus has just finished having breakfast with some of the disciples following their fishing trip. He questions Peter three times in a row, asking, "Do you love me?" This is the same Peter, remember, who denied knowing Jesus three times when He was being crucified. Yet, Jesus' isn't there to condemn Peter for his mistakes. Jesus meets Peter where he is. He helps Peter have a successful fishing trip and prepares a meal for Peter and His friends. It's obvious that Jesus blesses Peter with His presence. Jesus spends time with Peter. Peter is a little confused and hurt that Jesus questions his love again and again when He feels so sure of his own answer. And yet, I think Jesus is making Peter claim what he really believes. I think this is Jesus' way of strengthening Peter's faith. Jesus tells Peter, "Feed my lambs...take care of my sheep...feed my sheep...You must follow me (John 21)." In other words, don't make it a choice. And based on this conversation, Jesus also seems to be saying that Peter's "following" will be different than John's following (the beloved disciple who happens to be near). This makes me think about my conversations with Jesus. What about your conversations? Although my call may be specific to who God has created me to be in His image, the message is the same. What does "feed my lambs...take care of my sheep...follow me" mean for your life that your Savior has so graciously given you? Jesus comes to us again and again, showing us His love, and reminding us how to respond to His amazing and unconditional love, love that saves us. Thank You. Thank You for sending Jesus, our Savior, into the world to show us the reality of Your love at work in our lives. Thank You for all the ways Jesus comes to us and speaks to us, strengthening our faith and reminding us how to follow Him. Lord, Your grace, is alive and well. Thank You. Guide me with Your Holy Spirit. Nothing will be impossible with You...Here I am, Your servant, Lord; let it be with me according to your word (from Luke 1). And Lord, I pray for others. Use me to help strengthen their faith and open their hearts wide to Your grace and Your joy and Your call. Jesus appears to the disciples three times after He is raised from the dead. We get to read the third appearance in today's reading. It involves a miraculous catch of fish and several of the disciples. Simon Peter goes fishing with his buddies, and they don't catch a single fish. Then, Jesus joins them, and stands on the shore talking to them. They don't recognize Him at first. He gives Simon Peter direct and specific instruction to go back out fishing and try again. Peter listens. He realizes it's Jesus talking to Him. And the next thing you know, their net is so full of fish they can barely carry it to shore. I love this story because Jesus shows us who He is and how He works. 1. Jesus meets us where we are, as our closest friend. This could be a guys night out for all we know. The disciples are fishing. It's not usually a holy experience, but it becomes one with Jesus there. Jesus, himself, calls and claims us as His friends. We see it in this story, and it's not because we are "perfect" friends to Jesus. It's by His infinite supply of grace that is forever at work in our lives. So, as we think about our faith, we need to think of Jesus as our friend who is always there for us. 3. Jesus instruction and direction makes all the difference in our lives. As Jesus calls and claims us friends, He also sees us, knows our issues, and gives us direct instruction- and sometimes that means doing what we've already done, but with Jesus in our hearts and minds. Jesus makes our "nets full", not our own abilities. 4. Sometimes, because of Jesus' divine power, so much bigger than we are, we don't recognize Him in the world. Jesus is Emmanuel, God with us. And in the busyness of the world, we can miss His presence if we don't look and listen carefully. He can be standing among us, talking to us at any time, anywhere. 5. Jesus prepares and provides for us in abundance, and He invites us to share what He provides. Jesus said to them, "Come and have breakfast." None of the disciples dared ask him, "Who are you?" They knew it was the Lord. Jesus came, took the bread and gave it to them, and did the same with the fish. I noticed for the for the first time in my reading today that Jesus has prepared ahead of time for His friends, and they didn't even know it. There was a fire ready for them when they returned to shore, fish and bread waiting on them. Yet, in Jesus' invitation to have breakfast together, Jesus asks Peter to share some of the fish they caught too. I think our invitation is the same. Jesus calls us, instructs us, prepares for us ahead of time, gathers us, and invites us to share what He provides. So during this season of advent, in light of Jesus' upcoming birthday celebration, how might Jesus be inviting us to gather with Him and share the blessings He provides us? How might this story speak to my life and to your life? Thank You for sending Jesus to show us how You love us and to give us glimpses of Your grace and Your glory. Thank you, Lord, for all the ways You provide for me and nourish me with Your abundant love. Help me remember that You are the One who makes my life full, that by Your grace, my life is full of blessings. I pray for Your guidance Lord in sharing all that I have with others. Show me how and where to gather as Your friends. Open my heart to sharing Your blessings with those in my life who need it the most. Be with me, please Father, and use me for Your glory as I give gifts this holiday season and prepare meals. I pray for all those whose nets are empty today. Fill them, Lord, with Your hope, Your peace, and Your grace. May they find a friend in You. "These things happened so that the scripture would be fulfilled: 'Not one of his bones will be broken,' and as another scripture says, 'They will look on the one they have pierced.'" Our Savior, Jesus, is pierced for us, and his burial is so simple, so uneventful, so lacking in the grandeur we'd expect for God's Son, for God in the flesh, for our Messiah. It's so NOT what we'd expect. You'd think I'd know that by now if I know anything about God. It's never what we'd expect. It's better if we shift our prospective from our own to trusting in God's perspective that we can't always see from where we are in life. Two Jesus loving men, Joseph of Arimathea and Nicodemus, take care of Jesus' body and prepare it for burial. Two ordinary guys do something really extraordinary. Love is 75 heavy pounds of myrrh and aloes to lay Jesus' body to rest in a nearby tomb while no one is watching. Nicodemus and Joseph clearly believe in the one whom God sent to save them. And what they do as they take care of Jesus' mangled body is done in the sight of God. There's nothing ordinary about it. That is the grandeur of our faith at it's finest. I thank You for Your love for me and for the world. I thank You for the greatest gift I will ever receive, Jesus. Forgive me for thinking too much about what I'd expect instead of praying for Your perspective and Your light in all circumstances. I pray that I may dwell in Your house, Lord, all the days of my life, including my days in this world. Help me, Lord, to gaze on Your beauty and to remember to seek You and find You everywhere as You are (from Psalm 27:4). I pray for all those who desperately need to see Your beauty in the world, Lord. I pray for those who need Your light and Your perspective. Come to them, Lord. May they feel Your healing and inspiring presence. Jesus is beaten, tortured, forced to carry His own cross, nailed to it, and left to die. All the while, Jesus' mother, aunt, and friend are watching the whole scene unfold before their eyes. The clothes of God's Son, our Savior, are divided and lots cast for His undergarment. And like so many times when tragedy strikes, I find myself at a loss. Jesus claimed to be who He was. That's it, far from a crime. And we know, His life, death, and resurrection are so much more than we can figure out in this very moment. True to our human limits, our perspective struggles to fully grasp God's bigger plan. When Jesus saw his mother there, and the disciple whom he loved standing nearby, he said to her, “Woman, here is your son,” 27 and to the disciple, “Here is your mother.” From that time on, this disciple took her into his home. Even on His deathbed, nailed to a cross between two guilty men, Jesus is redefining our connections to each other and to Him. Through Him, we are called to take care of each other. Jesus asks us to think and act outside the box for Him, to love as He has loved. He defines who we are...even as the world is confused. In Christ, we are called to be gifts to each other. Thank You for Jesus who died on the cross for me. Thank You for redefining who I am and for purposefully connecting me to others. Lord, forgive me when I fall short of loving the way You do. Help me to take this time to remember You, my Savior, with every person that crosses my path. I pray for all those who don't fully know who Jesus really is in their lives. I pray for all those who are struggling and suffering as they take up their cross. I pray for all those who are having to watch those near and dear suffer. Help us all to find strength and hope and unshakeable purpose in You, Lord. Unite us, Lord, as we seek You, and inspire us to be the people You have created us to be. "In fact, the reason I was born and came into the world is to testify to the truth. Everyone on the side of truth listens to me." Meanwhile, there's Peter watching everything unfold from a distance...Peter, one of Jesus 12 disciples, denies His connection to Jesus a second and third time...and the rooster crows. These are not Peter's best moments. And because of that, I can relate to Peter. We all have these kind of moments...in hindsight we'd love a do-over. And I find hope in Peter and this truth Jesus brings to us. Because what Jesus does for Peter, Jesus does for me too. Jesus remained Lord of Peter's life, through the highs and lows, guiding Peter. Jesus overcomes our fears and helps us walk on water. Jesus sees us as He has created us to be (even when we aren't living up to His best for us). Jesus patiently forgives and teaches us throughout our lives in the world. And Jesus uses us in the most unlikely and extraordinary ways when we turn our lives over to Him. Yep, I find so much hope in reading Peter's story. A mess-up will not define us as believers. Jesus and all His powerful love for us does...and that's GOOD NEWS. I thank You for sending Jesus into the world to testify to Your truth. You give us a different perspective on life to the full. Thank you for opening my mind and my heart to Your Word. Forgive me for the ways I have followed You at a distance and all the ways I fall short of claiming You as Lord of my life. I know I mess-up and am far from perfect. I give my do-over moments to You. Use those moments in my life as teachable and transforming moments, Lord. I am made perfect in You. Help me to be the daughter (son), the sister (brother), the wife (husband), the mother (father), and friend, and the neighbor You created me to be. I pray for You to hold __________________ in your loving arms today. He/she/they is in need of a do-over, Lord. Help _______________ to be transformed by Your grace. Jesus gets arrested in today's reading. Peter denies being one of Jesus' disciples. The tension has been building. Jesus has been preparing us for all of this. And in today's reading in the book of John, Judas, having the inside scoop as one of Jesus' 12 disciples, brings an entourage of soldiers and officials to the garden of Gethsemane to capture Jesus. This is the part of Jesus' story I don't like to read. It's injustice at it's best. But here it is. Real. Raw. Mess. And it's part of God's story. An innocent man, God in the flesh, with all of His divine power, suffers at the hands of sinners. "When Jesus said, 'I am he,' they drew back and fell to the ground..."
What do you think God wants us to see and know from this hard-to-read scene? Notice, even the soldiers and officials with all their evil intent are affected by Jesus and His word as they fall when He speaks. Notice, Peter, a man with the inside scoop who has spent all the time he could learning from Jesus, denies the faith he knows in the heat of the moment. He illustrates just how vulnerable we are as we claim to follow Jesus. Notice, that none of this seems "right;" and yet, Jesus trusts God plan above all else. He takes what He is given. He has just prayed to God about it, and now He is accepting it. This is the way it is, what it is. The in-between part of God's glorious plan. We aren't to the worst of it, and we haven't yet seen the fullness of God's glory. But, we do get a sense of God's power in the moment... as Jesus faces His circumstances. We see a peace that is so unexplainable, so unexpected, so unnatural that we know God is working in Him. Thank You for Jesus who, being fully human, shows us what it looks like to follow Your will. As believers, we find hope in Jesus. We know that knowing You, and living in Your plan for our lives is both messy and glorious. And often times, we find ourselves somewhere in-between. Give us patience and peace to let Your plan unfold at Your will and not ours. Fill us with courage, Lord, to risk and to step out of our comfort zones. Help us to find You in the moment, to claim You as Lord of our lives, and to trust Your direction for us. I pray for all those today who are lost, who are scared, who don't know what they are doing in the world or why they are doing it. I pray for Your Kingdom to come and Your will to be done, Lord. Jesus continues praying to God for us in today's reading. If you are one of those people who is reading Jesus' prayer and wondering, doubting even, if His prayer really applies to You, Jesus makes it clear as He continues to pray. He's not just talking to His original 12 disciples. He is praying for all those who come to believe in Him. We can breathe in Jesus' reassurance. He's talking to us too. He loves us too. Jesus unites us through this prayer. He has given us the very same glory that God gave His Son, Jesus. He wants us with Him, and He gives us the same love God had for Him. How does knowing all this change your day? I thank You for Jesus' timeless prayer for believers. Lord, help me to soak in these life-giving words. Thank You, Lord, for loving me and saving me. Help me to remember Your love for me and for others in all that I do. And during this holiday season, when we remember Your birth in the world, help me to make my life a Hallelujah to all that You have so freely given me by Your grace. I pray today for all those who will gather together over the holidays. I pray that we would feel Your presence and appreciate the gift of time. Help me make room for You in my home, Lord. My door is open. I ask that You fill us ____________________ with gratitude and hospitality. I pray for my home to be a welcoming place for people to feel Your warmth and love. May people feel uplifted by their visits in this place. I also pray for all those who do not have a place to gather. Hold them in Your arms, Lord, and help them find You and a warm place to be with others. Jesus defines eternal life, something that seems so far off, somewhat impossible to grasp, and seems somewhat complicated. And when Jesus defines it today, it's so beautifully simple. Just know God and know Jesus whom God sent. And I think about what it means even today to "know someone." To really know someone is different than "knowing of" someone or being "acquainted" with someone. Really knowing means spending lots of intimate time together, sharing experiences together on a regular basis. 15 My prayer is not that you take them out of the world but that you protect them from the evil one. 16 They are not of the world, even as I am not of it. 17 Sanctify them by the truth; your word is truth. 18 As you sent me into the world, I have sent them into the world. 19 For them I sanctify myself, that they too may be truly sanctified. Jesus is praying for His disciples. As believers, we bring Jesus glory; we bring God glory. Jesus prays for our protection and asks that we be one, together with Him and with God, as they are one with each other. We hear that Jesus wants us in the world. He sanctifies us, which sounds complicated and overwhelming like eternal life...but Jesus makes it beautifully simple, again. Thank You for Jesus who makes me one with You. Thank You for this prayer that Jesus prayed so long ago that still fills my life today and sustains me as I live in the world you created. Help me to stay connected to You, Lord, always. Help me to remember Jesus' prayer for my life and to follow Your call daily, as Jesus did. Give me the courage to follow You, wherever You lead me. I trust You, Lord, to equip me for whatever You have in store for me. I want to bring glory to You, God. I pray that these words of Yours will reach those who need it this day, and they will be strengthened and empowered by Your truth. You are the light of the world, and Your Word is a lamp for my feet and my hands.